On the home page, click “Login/Register” in the upper right-hand corner of your screen. You will be required to select an account type, and should select "Organization." In order to ensure your company is not already registered, the system will request you enter your organization’s name. Slowly type your organization’s name in the text box and a list will populate below. If you see your organization in the dropdown list, that means there is an existing account. Click on your organization’s name. Some of the registration fields will disappear because Indiana INTERNnet already has your organization’s information on the site. A registered user from your organization will be notified of your request and will review your information to confirm your account. If the system does not find your organization registered with Indiana INTERNnet, simply complete the registration form. Be sure to select “Employer” as the organization type. Your registration will be sent to Indiana INTERNnet to review and approve. Once a staff member approves your account, you will be able to post internships and search for interns. If you have not gained full access to the site in 48 hours, contact us at INTERNnet@indianachamber.com. Indiana INTERNnet is a high-tech and high-touch system, built to enhance opportunities for individuals seeking internships and employers searching for interns. The high-tech portion allows employers to access our intern candidate database, advanced search features and the ability to contact students. Additionally, Indiana INTERNnet offers high-touch services that enable you to receive personal assistance, customized tools and much more. Are there any resources offered to employers? Indiana INTERNnet provides a variety of assessment forms, access to best practice information on internships and current market information on wages/benefits. Indiana INTERNnet has developed partnerships with Indiana University, Ball State University, all Ivy Tech campuses and IUPUI to share internships. New internships are shared weekly with those universities to be used on their job boards. Students who are interested in the shared internships will be directed to apply on Indiana INTERNnet. This will broaden your applicant pool and increase the visibility of your internship. I registered. Why can’t I post an internship? In order to provide the best possible service to students, Indiana INTERNnet reviews every new organization registration. Until a staff member approves your organization and grants you full access to the site, you will not be able to post internships. If you are joining an existing account, a registered user needs to grant you access before you can post internships. If you have not recieved full access to the site in 48 hours, please contact us at INTERNnet@indianachamber.com. How much does it cost to post internships? All of Indiana INTERNnet services are free for everyone. You may post an unlimited number of internship opportunities and have access to our intern candidate database for free. What kinds of internships can I post? Indiana INTERNnet allows any high-quality internship position. The nature of high-quality is determined by the duties outlined in the employer's internship description, and the employer's commitment to enhancing the student's learning experience. If you are unsure of the quality of your positions, Indiana INTERNnet will assist you in evaluating the tasks and duties. 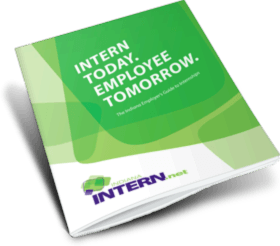 Download our Employer’s Guide for tips for creating a meaningful internship program. You may post short-term, long-term, project-based, virtual, paid and unpaid internships. If you're considering posting an unpaid internship, please review the U.S. Dept. of Labor laws. Internships can be either paid or unpaid. However, most internships on Indiana INTERNnet are paid positions. If you're considering posting an unpaid internship, please review the U.S. Dept. of Labor laws. Can I receive reimbursement for interns? Indiana INTERNnet partners with the Indiana Commission for Higher Education (CHE) to facilitate its Employment Aid Readiness Network (EARN) Indiana program. EARN Indiana reimburses employers with an approved internship up to 50 percent of each eligible intern’s wage. Click here to find out how to get started. Can I post full-time or part-time positions? No, we are an internship-only site. However, if you are trying to fill full-time or part-time positions, Indiana INTERNnet recommends you consider offering an internship as a recruiting tool. How many internships can I post? Indiana INTERNnet has no limit to the number of internships you can post. However, each employer should carefully consider the appropriate number of interns to ensure a high-quality internship experience for the interns. My internship’s status is “Expired.” What does that mean? Change the internship’s start date to a date in the future. If your position was EARN Indiana approved, see question #16. Make the position inactive by clicking the internship’s title in your workspace. Then select “Inactive” from the “Status” dropdown menu. Mark the position as filled. See question # 26 for instructions. My internship is EARN Indiana approved. Why can’t I adjust its start/end dates? Once an internship has been submitted for EARN Indiana approval, the start and end dates cannot be changed. If you need to make any changes, contact us at INTERNnet@indianachamber.com, and we will adjust the dates for you. How will I know when a student has applied to my internship? You will receive an email each time a student applies for your internship. You will be able to see a list of applicants in the “Applicants” box in your workspace. Am I required to hire an intern for the positions that I post? No. If you do not find an intern that matches your interests or needs, you are not required to accept an intern via our site. Can I change my company's information? Yes. You can change your company's information at any time. Edit your profile by clicking “Manage the (your organization’s name) profile” located in the gray box on the right side of your dashboard. Can I put a link on the website? Yes. You can enter your company web address or links to required applications by clicking “Manage the (your organization’s name) profile” located in the gray box on the right side of your dashboard. How can I access a specific applicant’s information? Click on “Login/Register,” and log-in with your username and password. Scroll down on your dashboard to find the list of applicants. Click “Download Resume” located in the grey box on the right side of the page, or at the bottom of the white box containing the applicant’s information. If you do not see the “Download Resume” links on the applicant’s profile, they might not have a resume uploaded. You may contact the student to request his or her resume. If the applicant uploaded a PDF file, his or her resume will automatically pop up. If the applicant uploaded a .doc or .docx file, his or her resume will download and be available wherever downloaded files are located on your computer. After you open the applicant’s resume, you may save and/or print the file if you would like. How can I contact an applicant? You can contact an applicant by the phone number or email address provided in his or her profile. You can also contact a student through our in-site messaging system. Simply click "Contact This Intern" at the bottom of the student's profile. A student says he/she is on the website, but I cannot find them. I’m not having luck finding an intern. What can I do? Make sure that you have completely filled out your internship’s description. The more specific its description, requirements and responsibilities are, the easier it is for students to find you. You can do this by clicking your internship’s name located in the “Internships” portion of your dashboard. Then click the “Description” tab to make edits. Remember that the search for an intern can work both ways! Just as students can use the site to find you, you can use it to find them. Utilize the “Advanced Intern Search” in your dashboard to search for interns by keyword, school, major, location and more. If you still are not able to find a match, contact us at INTERNnet@indianachamber.com, and we will be more than happy to assist you. What happens when I find an intern? That’s great you found an intern! Because the state looks to us for internship metrics, we ask that internships be marked as filled on the web site whether or not the students were found through Indiana INTERNnet. In order to mark the position as filled, click the green silhouette with a plus sign to the right of the internship’s title in your dashboard. Then, fill in the student’s name, school, expected start date and expected end date. If your internship is EARN Indiana approved, and you are hiring an EARN Indiana-eligible intern, you MUST mark the internship as filled on Indiana INTERNnet in order to receive reimbursement. You can do this by selecting the student’s name in the "Select an Applicant" dropdown menu or entering their name in the "Search for an Intern" text box. If the student's name doesn't appear in either of the two locations, please contact INTERNnet@indianachamber.com. I want to post the same internship. How may I do that? If you would like to re-post the same internship at a later date, click the two pieces of paper located to the right of the internship’s title in your dashboard. Modify any of the internship’s details, and make sure to update the start and end dates. Select “Active” in the “Status” dropdown menu to make the internship visible on the site once it’s saved. I have an EARN Indiana approved position and I need help entering my intern's hours for reimbursement.